The Nativity has been illustrated by artists and sculptors since the Middle Ages. It was during the Renaissance however, that artists produced paintings of this Biblical account in the greatest numbers. Although there have been some wonderful paintings of the Nativity produced after the Renaissance, such as William Bouguereau's (1825-1905) 'Song of the Angels', it declined in popularity as a subject matter from the 18th century onwards. 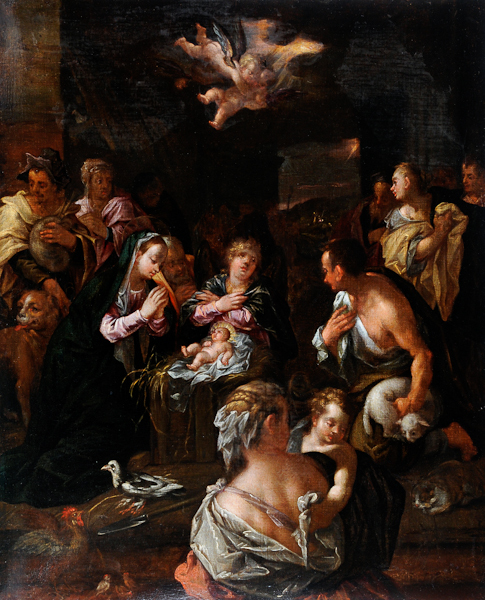 Today it is generally the illustrator who depicts the Nativity scene, mainly for Christmas greeting cards. "Fear not; for, behold, I bring you good tidings of great joy, that shall be to all the people: For, this day, is born to you a Saviour, who is Christ the Lord, in the city of David. And this shall be a sign unto you. You shall find the infant wrapped in swaddling clothes, and laid in a manger." We see Mary and Joseph, together with an angel and a shepherd, kneeling down praising Jesus. Other people have also joined the group, and there is a glow coming from the sky outside the stable. This could be the light created by the heavenly angels, or the artist could have merged St Matthew's account with St Luke's, and the light could be the star that appeared to the three wise men. In this painting it is likely that symbolism has been used to add to the pictorial story. We are invited into the group by placing us in a position where we are looking over the shoulder of the female figure in the foreground. This makes us a participant as well as a viewer. The woman is most probably St Elizabeth holding the infant John the Baptist, considering the close proximity of the child to the lamb, one of the symbols attributed to John the Baptist. At Mary's feet we see a dove, which is a common Christian symbol of the Holy Spirit, but it may also relate to the turtledoves Mary and Joseph sacrificed after Jesus' circumcision, which closely followed the Nativity. At the bottom of the painting we also see a hen with her chicks. This could be making reference to Jesus comparing himself to a mother hen when Pharisees warned him that king Herod, was planning to kill him. The cat ready to pounce on the defenceless chicks, seen to the right of the painting, could symbolise the danger of straying from the protective wings of God, but may also symbolise the tragedy that befalls Jesus when he is crucified on the cross. Perhaps to reinforce this message of sacrifice, a spear lying on the ground points straight at the mother hens heart.